Engaging the caller: Telecom players have more than doubled ad spends over the past year. 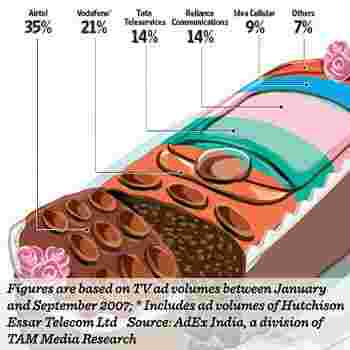 Bharti Airtel leads the pack in terms of television ad volumes. Mumbai: It is talktime for cellular service providers. Most leading telcos are buzzing the Indian ad space with a flurry of advertisements: some are changing names, and others, creative direction. The aim is to stay relevant in a rapidly evolving,?highly competitive category. Evocative red and white visuals inform us that Hutch is now Vodafone. Co-branding ads for Airtel-GoogleSearch primarily target the youth with their technology edge. The ‘MobilePe Internet’ campaign for Tata Indicom talks about the installation of browsers on certain Samsung mobile handsets. At the other end of the price band, the ‘Bol India Bol’ campaign promotes free talktime on Reliance-to-Reliance phones. And in a populist tack, Idea Cellular Ltd’s corporate campaign has brand ambassador Abhishek Bachchan expounding on how numbers (telephone numbers) will make everyone equal. Not surprisingly, total ad volumes rung in by cellular service operators more than doubled to 9.24 million seconds between January and September, from 4.56 million seconds in the corresponding period last year, according to TAM Media Research Pvt. Ltd. The change in ownership of the adorable pug from Hutch to Vodafone is just one visible strand of a larger phenomenon: Telcos have moved beyond simple black-and-white strategies of tapping either high-end customers or the mass market and are now pushing their value-added services. Thus, Reliance, which is trying to move away from its legacy of a mass-market brand (largely on account of its initial aggressive promotions that grew the entire market) is pushing services such as Internet and music. Vodafone’s accent is on promoting features beyond basic voice—such as ring back and caller tunes. Idea is pitching itself as a youth-friendly brand. And Tata Indicom’s pitch is not very different from Reliance’s. Even as they look to grow their value-added services business, however, telcos are looking to target the rural market. With everyone speaking of similar benefits, brand identities are, however, overlapping, and positioning is sometimes not consistent. “Telecom operators ought to understand that their basic positioning must be simple and easy to understand. The brand which best exemplifies this is Hutch. A brand has to bring in a certain degree of simplicity in brand imagery which can be its differentiating point," says Unni Krishnan, Brand Finance (India) Pvt. Ltd, a brand valuation consultancy. The position of cellular service brands in the pyramid seems clear. Harish Bijoor, CEO, Harish Bijoor Consults Inc., says Hutch, now Vodafone, is at the top; Airtel is mid-rung; and at the bottom are Idea, Reliance, Tata Indicom. “If you are (at) the top of the pyramid, the Arpu (average revenue per user) is that much more. If you are at the bottom, it’s shallow. Nearly all operators are (also) targeting corporates as subscribers; Reliance and Tata Teleservices are doing so aggressively." The arrival of global brand Vodafone Group Plc. has changed the dynamics of this sector. 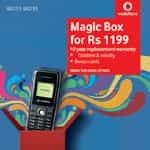 Its creative strategies have focused on various applications and tariffs such as MSN Search on Hutch and, more recently, Vodafone’s Magic Box, which contains two mobile phones and offers such as free talktime and group messaging. Says Rajiv Rao, executive creative director for South Asian operations, Ogilvy & Mather Pvt. Ltd, which looks after the Vodafone account: “The MSN search move came at a time when the relevance of search for an increasingly mobile country was huge. The response has been very encouraging." Says Harit Nagpal, marketing and new business director, Vodafone Essar Ltd: “Our first priority was to dispel any sense of discomfort over the transition. We continued with the pug. Subscribers found that the basic values that Hutch stood for remained much the same." Brand consultants, such as Chlorophyll Brand & Communications’ Khalap, do, however, have some reservations about Vodafone’s strategy. “To survive in a pseudo-mature market, service providers attempt to be attractive to all segments of the market. Orange/Hutch used to be the exception: It aimed at the higher end of the market, to experienced users instead of first-time users, but the current Vodafone strategy seems to be to broadbase the brand. This strategy of being all things to all people cannot work; it does not work in theory or practice," says Khalap. Yet that’s just what every telco, including market leader Airtel, wants to do. Take Airtel ads which highlight VAS such as instant messenger, GPS (global positioning system—a user can pinpoint his or her location on a map by working out where he or she is in relation to a satellite), Music-on-demand on Airtel-MTV or Shuffle GoogleSearch. Says R. Chandrasekar, head, brand and media, Bharti Airtel Ltd: “Airtel customers straddle all ages and economic classes, and hence, they don’t follow a one-size-fits-all demographic segmentation." Airtel’s communication works around three pegs: Brand track (‘Express Yourself’ campaign, where the tone is aspirational and brings out an iconic brand); Network track (the ‘Bandhan Atoot Hote Hai’ campaign, which is emotive); and Innovation track (Airtel was the first to bring BlackBerry and Pearl mobile models to Asia), Chandrasekar explains. Airtel is poised as a future-facing brand, says Amitesh Rao, national business head, Rediffusion DY&R Pvt. Ltd, the agency which spearheads the Airtel account. Its music-on-demand campaign allows viewers to dial a number and choose a song. Reliance Communications Ltd’s recent commercials are ‘Sawaal’ and ‘Advice’, which talk about their unlimited free Reliance-to-Reliance calls for a nominal monthly fee. Says Sanjay Behl, head, branding and marketing, Reliance Communications: “We have a highly fragmented marketing campaign, and it works for us. Our first communication plank is network superiority, since we reach 15,000 towns till date. Our next plank is the handsets we offer—Classic range (proprietary ones) and co-branded (with Nokia, for example). Other areas of communication are VAS (caller tune pack, cricket SMS pack and service-sale-tariff packs)." The company may get into advertiser-funded programmes (AFP) on television (special programming built around the brand and built specially for it), provided these are placed in prime time. “We have till now had scrollers and tickers across news channels. We could experiment with AFP, although there are no concrete plans at the moment," adds Behl. A thrust area for Reliance is technology-related services. Says Behl: “With Yahoo, we have a tie-up on messenger (IM service) which you can access via our service. We are working with Callcomm Technologies Inc., which aggregates many applications, and we could launch several path-breaking ones in future. We also plan to launch mobile blogging on the Reliance platform. This would be our own service." Tata Teleservices Ltd too is targeting both the mass market and high-end customers. Says Abdul Khan, vice-president, marketing, Tata Teleservices: “We have followed a two-pronged approach—advertising for the masses, such as the unlimited talktime on prepaid for Rs999, and advertising for the classes, the USB Plug ‘N’ Surf broadband ad. Where competitors are talking about search or WAP (wireless application protocol), we are going the whole hog with a browser attached to the phone. Tata Indicom’s Web browser has been introduced on the Samsung Explore handset priced at Rs5,000. This price would be reduced further." Applications and VAS add subscribers and, according to Khan, the company is adding about a million each year to both its prepaid and post-paid subscriber base. The company is also changing the name of its 3,000 True Value shops to Tata Indicom exclusive stores to create a network identity. “We bring in tangible experiences. Towards Diwali, we had scratch-and-win contests," says Khan. The company is also leveraging an AFP on Zee TV called Fun on the Run, which features a treasure hunt. Idea Cellular’s earlier thematic campaign showcased the Idea Tune with the tag line: ‘An Idea can change your life’. Instead of promoting services or tariffs, the company has now revamped its corporate identity, with brand ambassador Abhishek Bachchan in a new advertisement. All Idea communication now ends with: ‘What an Idea’ and then the baseline, ‘An Idea can change your life’. Explains Nikhil Rao, group creative director, Lowe Lintas India Pvt. Ltd: “Idea had gone without a brand ambassador for too long. The brief was to attract rural and semi-urban audiences. The campaign attempted to reinvent the brand and push it to the next level." K.V. Sridhar, national creative director, Leo Burnett India Pvt. Ltd, the agency that handles rival Reliance advertising, however, says: “Ultimately, it (Idea) doesn’t come across as a consistently positioned brand. You don’t understand what the brand is trying to say with the whole Abhishek Bachchan and numbers ad. It’s a similar case with Airtel, which talks about deprived children and coffee-tea vendors on the one hand, and then suddenly drifts to high-tech and GoogleSearch." That seeming dichotomy is unlikely to change now. As they try to grow numbers, India’s telcos will look to grow the rural market. And as Google, Yahoo and other Internet firms realize that most Indians will access the Internet for the first time on their mobile phones, they will launch more services for phones, resulting in more advertising by telcos pushing these services. • Create a different brand of MVNO (mobile virtual network operator) to attract a different segment. Virgin was the first MVNO, and was successful in the UK and US in attracting the younger segment. • Use the launch of new technology phones to create a difference. For instance, HTC Touch or BlackBerry with Airtel. • Leverage value-added services to create a brand. The value of mobile data services ($31billion in 2006, about Rs1.44 trillion then, according to research firm Informa Telecoms and Media), exceeds the value of paid services on the Internet. The largest categories of mobile services are music, picture downloads, video gaming, adult entertainment, gambling, video/TV. A look at the ads and strategies of the Top 5 telecom service providers and what Unni Krishnan, managing director, Brand Finance (India) Pvt. Ltd, thinks of them. Is seen as an indigenous brand. In a defensive bid, the company is trying to revamp the brand, and change the way it approaches the market. Going to rural areas is the next growth engine for the company. Tag line: Google on Airtel Live: Search made simple. • In the search for the ‘Book of Solomon’, a girl armed with Google on Airtel beats the more seasoned adventurers. • In the music-on-demand spot, an array of musicians appear when a woman snaps her fingers. Airtel also got VJs on leading music television channels such as MTV and Channel V to snap their fingers and play the next song, as a 360-degree initiative. Is a challenger brand and seen as global, edgy, techno-savvy, ahead of the times. The level of global value-added services (VAS) that Vodafone has forces other players to move faster. • Pug now in a Vodafone red house. Animated characters in an aircraft, with a Vodafone banner trailing. • Magic Box with handset. Creative shows a magic box and people emerging from it—family members, violin-sporting musicians, a handset, bonus cards, etc. Baseline: ‘Har Pal Mein Kitna Kuch’. Seen as a trusted brand, but overall performance is disappointing. Needs to wipe the slate clean and start afresh. • Tata Indicom flags off Mobile Internet with its new commercial that talks about standing in queues at the airport, library or discotheque. The message: Switch to Tata Indicom on Samsung Mobile, which gives you an Explorer and high power Internet. • Brand ambassador Kajol offers her Tata-to-Tata unlimited talktime prepaid card to a young girl talking at breakneck speed to make best use of her limited talktime. A brand that is working hard, but which has not yet leveraged its mother brand’s equity. The original scheme of moving from the lower to middle rung has not been quite successful. Its pitch confuses customers. • The campaign has two commercials—‘Sawaal’ and ‘Advice’. The ‘Sawaal’ film takes the line that Indians are full of questions, while ‘Advice’ shows tricky advice scenarios: bachelor advice, marriage advice, first night advice, et al. • Reliance has launched unlimited Reliance-to-Reliance calls at Rs399 a month, so Indians can talk as much as they want. It is not a sizeable national player as yet, so it makes sense to have a brand ambassador. For Idea, the merger and acquisition strategy should be the device to build critical mass under the Aditya Birla Group brand name. • Abhishek Bachchan, the village head, proposes that everyone ought to be known by his or her mobile number, and not by his or her name. This ends all strife. A villager tells Bachchan, “What an Idea, Sirji!" followed by the Idea logo and tag line, “An Idea can change your life".